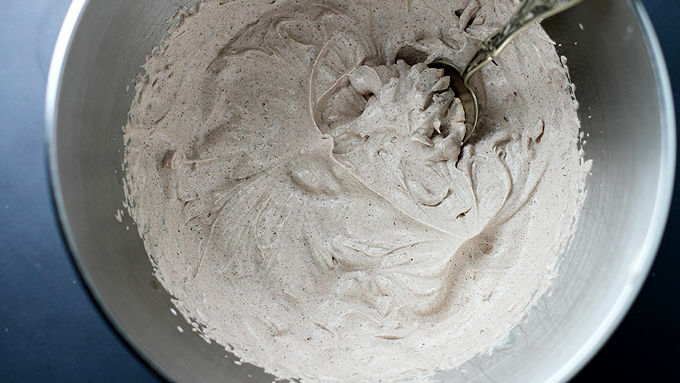 For the chocolate whipped cream: Place chopped chocolate or chocolate chips in a large bowl or bowl of a stand mixer. In a small saucepan over medium heat, heat sugar and 1/2 cup heavy cream until sugar is dissolved and mixture is warmed through. Pour heavy cream mixture over chocolate in bowl; stir until well combined and melted. Chill in fridge 30 minutes until completely cooled. Add remaining 1/2 cup heavy cream to bowl; use an electric hand mixer or whisk attachment in stand mixer to beat mixture on high until stiff peaks form. For latte: In a small (clean) saucepan over medium heat, heat coconut milk until warmed through. 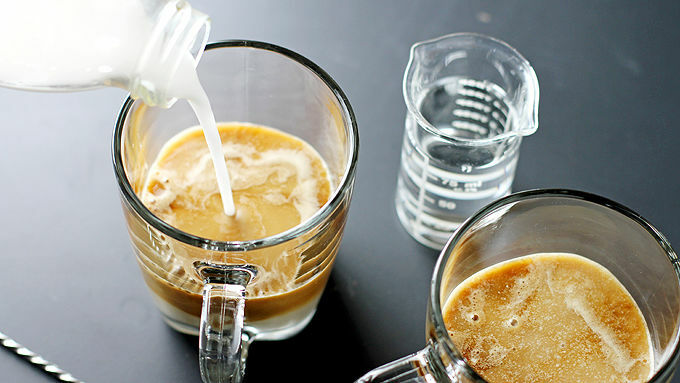 Pour 2 ounces espresso in each of 2 mugs. Top each with 3/4 cup of the warm coconut milk. Pour 1 1/2 ounces coconut rum in each mug, if desired. For a non-alcoholic version, simply omit the rum. Be sure to use coconut milk from a carton, not the canned kind. Feel free to add more espresso (and rum!) to the latte for a stronger coffee and coconut flavor, if desired. Like the famous coffee shop version, but dialed up a notch! 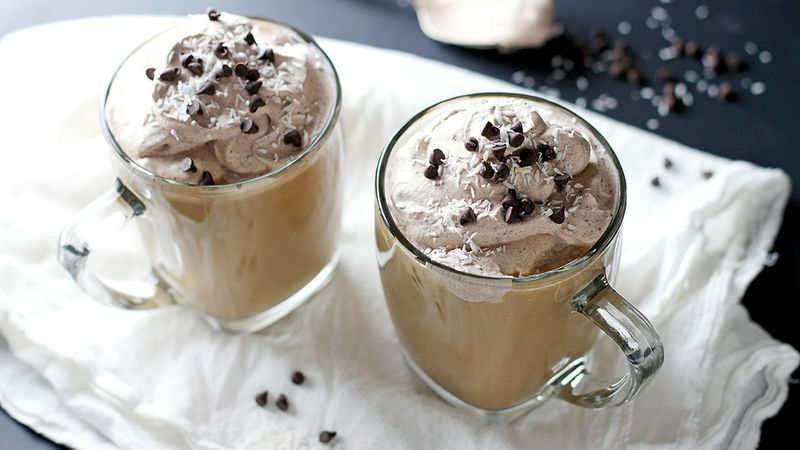 What is a world without coconut rum lattes (and chocolate whipped cream)? A sad one, that’s what. Such was my world until just recently, when I not only heard that a famous coffee shop is going to offer coconut milk lattes, but also when I discovered the delicious treat that is this homemade coconut rum latte – which dare I say is even tastier than anything you can buy in a green and white cup. And the best part is that it comes together in no time! I’ll drink to that. This recipe makes two servings, which can also be one serving if you like a lotta java and a lotta rum… a-hem. But it’s also easily doubled, tripled, etc. so you can make it for a crowd. Plus, you can always make these non-alcoholic for, you know, early mornings or whatever – just omit the rum! If you want your whipped cream garnish to be non-dairy, by all means, substitute non-dairy whipped topping, or just whip some coconut milk! Note: Use the coconut milk from a carton, not a can! You can use sweetened or unsweetened, though I prefer the unsweetened kind so it lets the sweetness of the rum and whipped cream shine through. Up to you! Top each mug with a generous dollop or 12 of the whipped cream (go big or go home here, because may I remind you it’s CHOCOLATE whipped cream). Add some mini chocolate chips and coconut flakes on top, and serve immediately. Repeats are encouraged. This is choco-coco-rum-o-latte heaven. Step aside, coffee place! We’ve got this coconut latte thang down.